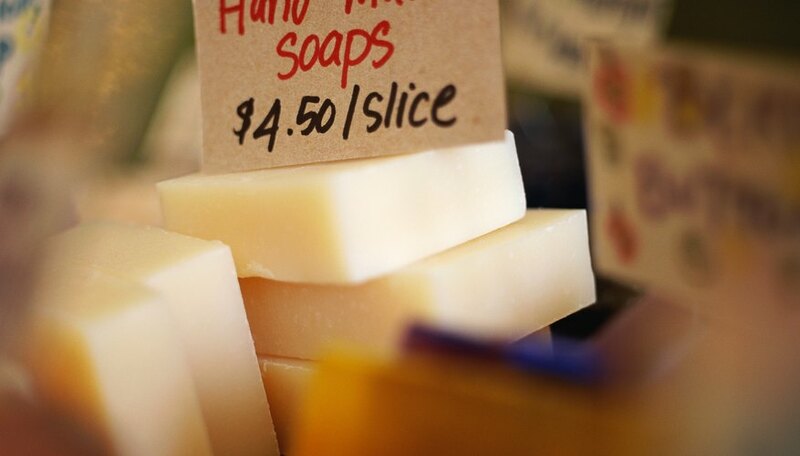 Lye is a controversial ingredient in soap that, while required to convert fats and oils to soap, is not necessary for those making natural soap at home. If you want to make homemade soap without having to use lye as an ingredient, it is as simple as purchasing soap bases such as glycerin from specialty and craft stores. These soap bases can be easily transformed into homemade soaps with your choice of fragrance and color. Add a small amount of water to a double boiler, and bring it to a boil. Add your desired amount of soap base to the top section of the double boiler. It takes several chunks of soap base to make one bar of natural, homemade soap. Cover the double boiler, and melt the soap base over low heat. Stir it gently and infrequently, so as not to introduce air into the mixture. Mix in your desired additives once the soap base has melted. Add fragrance to your soap with several drops of your favorite essential oil. TeachSoap.com advises stirring the essential oil into the mixture until it is no longer cloudy. Add several drops of food coloring to your soap if desired, as well as any moisturizers or vitamins. Stir gently and thoroughly. Spray some soap molds with cooking spray to prevent the soap from sticking. If desired, add dried flowers or herbs into the empty molds to decorate the soaps. Pour the soap base mixture into the soap molds. Allow the soap to cool and harden completely, which takes approximately three hours. Remove the soap from the molds once it has hardened. It is helpful to melt solid additives, such as cocoa butter, prior to adding them into your soap mixture. Exercise caution when working with a hot double boiler.